A luxurious, large, modern home set on 100 acres 8km from Maleny. Maleny Springs Farm is truly unique. No other property can offer what we can & we are delighted to see our guest reviews confirm this. 100 acres yet only 8 kms from Maleny village and 6 km from Tiffanys wedding venue. 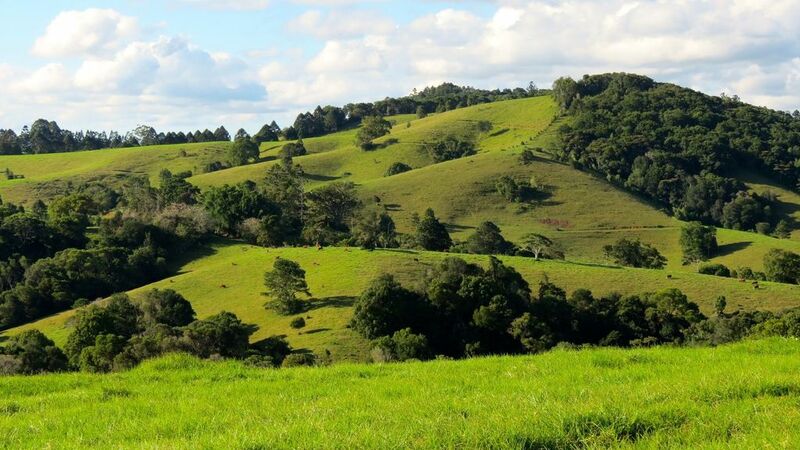 Drive down a country lane & you will find Maleny Springs Farm occupying 100 acres of emerald green, rolling hills. Our lovely, spacious, modern house is set high on a hill with beautiful, long views in every direction. You can walk for hours with only our cattle, 4 polo horses & our young foal Storm, for company. Enjoy a picnic by the Obi Obi creek & hopefully sneak a peak at out timid platypus & echidna or dine at the local cafes & fine restaurants. Enjoy a romantic weekend, family celebration, honey moon or farm stay with your family. All this & only 8 km for Maleny village. Sadly, we cannot hold weddings due to the access road in however, we can offer perfect wedding accommodation as we close to Tiffany's, only 6 kms away, Maleny Retreat & Maleny Manor. We offer a perfect house for bridesmaids and grooms to prepare for the big day. Maleny & Montville offer many attractions including art galleries, antique shops, quirky gift shops, health spas, cooking schools, cafes & fine restaurants. There are local waterfalls and rainforest walks. Maleny Botanical Gardens is only 3km & Australia Zoo just 30 minutes drive. Mooloolaba 35 minutes, Noosa & Brisbane one hour's drive. It's so beautiful & really close to Maleny. 100 acres is all yours! No other property can offer you a beautiful, modern home set on 100 acres, yet only 8 km from Maleny village. A 100 acre cattle & horse breeding property in a beautiful setting of rolling green hills. Abundant wild life, parrots and creeks. Secluded & private. Maleny village is only 8 km away.Totally unique! The beautiful rural village of Maleny is only 8 km away. A terrific spot to relax and unwind, take short walks to beautiful water courses. So very peaceful, and relaxing, with a beautiful vista. Well appointed house with all amenities supplied. Thank you for your lovely review. We are very pleased you enjoyed our beautiful property & hope you come again. It really is special. Maleny Springs Farm was the perfect getaway, beautiful views, beautiful mondern home with everything you could need and plenty of room! Absolutely loved our stay! Thank you for your lovely comments. It’s nice to be appreciated. A lovely house that is well set up in a beautiful and private location. There is a real sense of space about the property with the surrounding paddocks and hilltop setting. A short pleasant drive in to the town of Maleny with many places to eat. The hosts were particularly friendly and made us feel very welcome. We stayed nearly a fortnight and wanted to stay longer. We would love to return. What a lovely location! Beautiful spot to watch the sun rise over the hills. The house was well appointed and really felt like a home away from home.Also minutes from Maleny township/dairy/Mary Cairncross park.We are looking forward to our next stay!! Thank you! We had a perfect week at Maleny Springs. Lovely house, beautiful views, cosy fire. It was our second stay and we will be back. Thank you Philip. We look forward to seeing you all again very soon!